Fishing inLycksele - Many possibilities! Vindelälven has had a very positive development in salmon migration in recent years. National regulations in the sea and coastal areas have, together with the Ume / Vindelälvens Fisheries Council’s work, raised salmon stocks. The best places in Lycksele Municipality are Djupselforsen and Vindelgransele FVO. Storgräsforsen (Djupselforsen FVO) is an area that fits fly fishing, while many other rapids are fished most efficiently with spinning. The Vindel River is wide and rough, which means that the front stretches are relatively hard-worn, and therefore more suitable for spin fishing. Locals often fish from the boat to be able to present baits best. There are also nice jerseys in Vormsele and Björksele fvo. The season lasts from the last week of July to mid September. Within the municipality there are some really nice flowing streams for grayling and trout. The finest stocks are found in watercourses characterized by relatively strict fishing rules and a special fishing license. Two of these with fine places are Pajäcken (Blåviken FVO / SveaSkog) Ruskträskbäcken (Ruskträsk FVO with quota for number of cards) and Rusbäcken (Kattisavans FVO) . 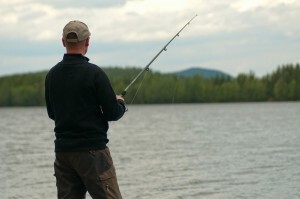 In order to maintain the fine quality of fishing, it is necessary for fishermen to treat these waters carefully. Granån (Granåns FVO) is another fine river with trout and grayling, and it is very suitable for fly fishing. The Vindel River’s rapids hold a fine stock of graylings, while it is more unusual to catch trout. There are several lakes with regular release of fish that can grow into the water, thus becoming very similar to wild trout in both behavior and appearance. Sveaskog’s release in the Lyckan area is very nice and well worth a visit (about 30 min drive from Lycksele town center). Umgransele fvo also is also nice for fishing, as well as for birdwatching. In Långsele and within Örträsk FVO (Varga-Hedtjärn) are fine tarns which sets out ready for catching fish. Vänjauträsket (Sörbäckens FVO) probably has the municipality’s finest stock of wild, large-scale lakes. There is also a boat for rent. These species are found in almost all waters of Lycksele municipality. The Umeälven holds nice stocks of large pikes and perches. Umgransele FVO is famous for coarse pike and they have a number of boats for rent. Kattisavan and Blåvikens FVO are also recommended, as well as reservoirs near Lycksele town. Here a boat / canoe is recommended to be effective in fishing. It can be difficult to access the finest routes from land. Örträsk and Sandsjön (Örträsk FVO) also have good possibilities for fishing pike. Öreälven and Vindelälven’s sealing areas are also a good tip for those who are looking for big and combatable pike and perch.